With time perhaps our most valued resource, AV-IQ protects its use by compiling AV product options in an accessible, thoughtful manner that facilitates buyers' decision processes. Manufacturers can update their product content in one spot with the potential to reach their entire AV reseller network! AV-iQ has relentlessly implemented changes that turns the chore of Audio-Video research into a pleasure. Long gone are the days of stacking binders to the ceiling just to find all of the needed information. Instead, buyers, specifiers, and system designers can research with a swipe or click to find and build the world’s best AV systems. One of the greatest challenges of the 21st Century as a manufacturer or reseller is the proper management of digital product content for your website, employees and customers. AV-iQ has not only met that challenge, but led the way and been an invaluable tool for Comprehensive and the entire AV industry. Comprehensive is proud to have been an early adopter of this technology and I can think of no better tool for efficiently managing and distributing accurate and timely product content to resellers and end users alike. I would highly recommend it. If you run a small business you should consider using AV-iQ. This resource has helped Nigel B Design gain visibility for our anti-vibration products. As a small manufacturer AV-iQ provides the ability for us to cost effectively market directly to the end-user while also providing an invaluable resource for our business partners. The resource is simple to use, saves time and improves communications. AV-iQ is a great resource tool for our customers. We’re able to provide information about our products in real-time, receive product inquiries, and participate in programs around a product launch. As this platform continues to improve, we look forward to working with the AV-iQ team. MuxLab has long been a valued member of AV-IQ. This is a premier repository of news, installations and products that cover the entire pro AV industry. We’re pleased with their commitment to continually upgrade their system to deliver results for not only us, but for our resellers and customers as well. As a leading, braided sleeving manufacturer, we have been watching AV-IQ evolve throughout many years. The new web site is very user friendly even for those who are not too computer savvy. 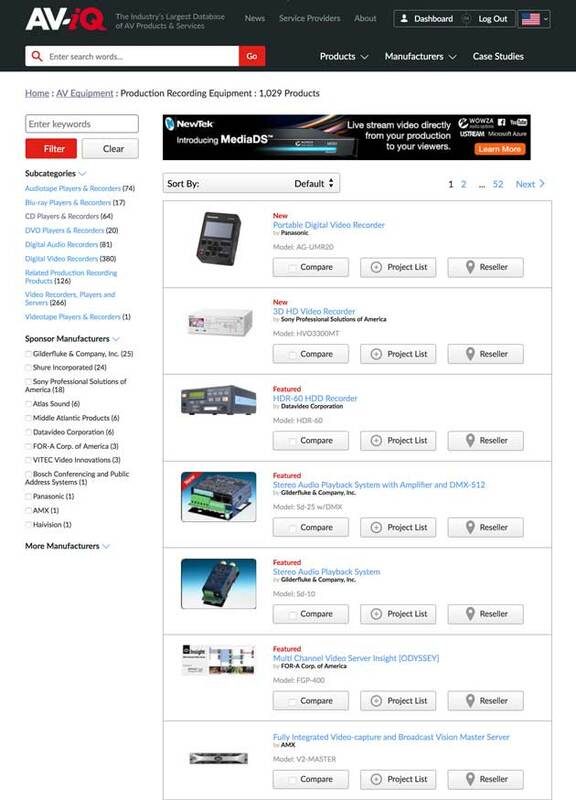 All AV products, manufacturers, and prices are in one great database, reachable within seconds. That’s absolutely amazing. Easy to navigate and clean look. AV-iQ has been invaluable in amplifying and distributing our announcements and product information. The reach and indexing of the AV-iQ content ensures we are positioned aggressively in front of potential buyers and resellers. It also expedites the delivery of product catalogs to the AV community. Having AV-iQ as a data partner has definitely benefited Spectrum. AV-iQ is extremely valuable for manufacturers and dealers alike. 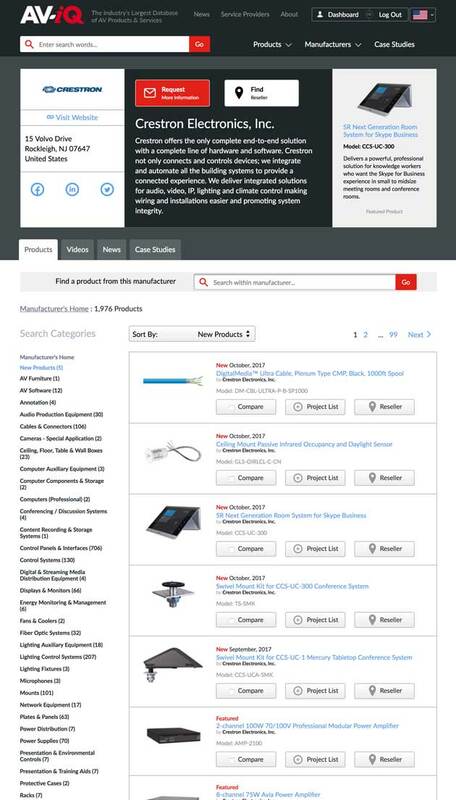 With simple yet robust tools for manufacturers to easily upload product specifications, copy, images and data sheets, AV-iQ’s AV product database is simply unmatched in the industry. Partnership with AV-iQ also provides manufacturers with access to a prominent dealer and reseller base, and gives these dealers/resellers a single, comprehensive destination for all AV products and companies. 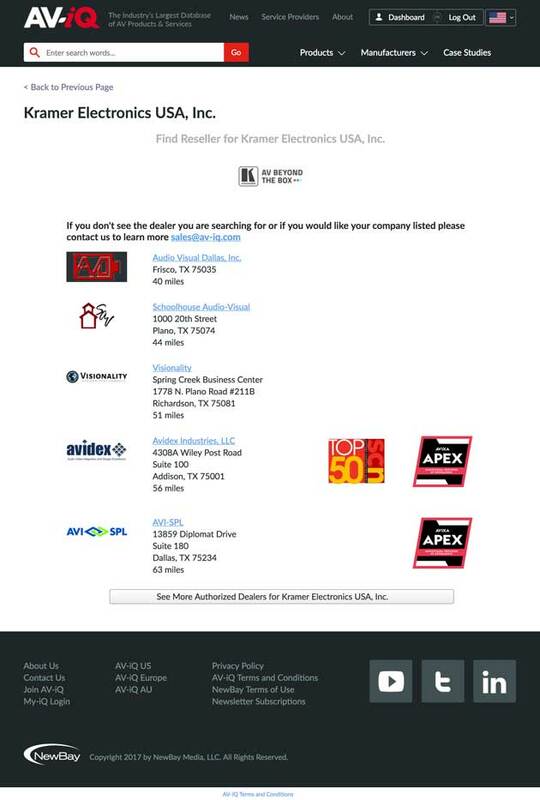 The AV-IQ website is very intuitive, encouraging our constant attention in keeping our product information up to date. We have found it to be a welcome addition to our ongoing marketing efforts and has increased our brand awareness and lead generation. AViQ is a valuable showcase for our products and solutions, and expands our visibility in the industry. It’s a great resource with clear navigation and really useful search tools. The platform’s simple data transfer makes it easy to keep our information up-to-date, which is key. Plus, the AViQ team is great to work with!